When you hear 'syllables', do you think about how a word appears in a dictionary? Or split across the lines in a book? Or do you think of '6 types of syllables'? In That Reading Thing we go mostly with the descriptive syllable method with a slight tweak in favour of suffixes and prefixes. That means, in the first TRT lesson, a student can choose to say rob/in or r o/bin and both are acceptable. Likewise in the second lesson with e/stab/lish or es/tab/lish. However, even if they prefer (as I do) to say in/ven/ted, we always nudge them towards /in/vent/ed so they understand the meaningful 'ed' ending. 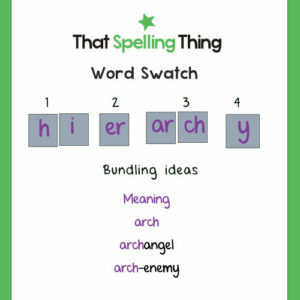 Some of you will have seen my little videos of building and spelling the word, 'hierarchy'. In both of those, the student said the syllables were hi/er/ar/chy and I was happy with that - even when she made the inevitable spelling error of <key> for the last syllable. While writing That Spelling Thing, it dawned on me that stronger spellers with large vocabularies (like teachers and actors in spelling videos) can get away with splitting syllables almost any way they like, but weaker students need more support, not only for spelling but for grasping and remembering meaning. For this reason, in the new book, I ask teachers to consider nudging the syllables to make the meaning of the word as clear as possible - in this case, hi/er/arch/y. This will also support memory for spelling when it's bundled with other <arch> words. Conclusion? Students don't need to know syllable types or rules and should stay right away from dictionary syllables. They do need to know how to pronounce words clearly and they might need a nudge to preserve root words and suffixes that will that aid memory. Please remember that no one expects you to know all this. If you're not sure how to split a root from a suffix, please don't worry. That Spelling Thing is a jumping off point for accumulating knowledge about spelling. The TST lessons ensure you can make the most of limited memory and you can use social media to ask about the specific words that are challenging your students. Our watch words are 'cumulative and collaborative'. That goes for both teachers and students.